MAFPRFC U16 squad enjoyed a fantastic rugby tour to St. David’s RFC in Pembrokeshire, Wales from Friday 17 June to Sunday 19 June 2016, the tour was the original idea of previous coach Hamish Grant who wanted the boys to have a tour experience having missed out on the usual club P7 tour. From start to finish there was a real feeling of being a team with no friction whatsoever, to a man the whole squad came together as a single unit. This tour will see some of the squad leaving the club to allow the boys start working or university, with a few staying at U16 level for another season, some potentially moving on and the bulk moving to the U18 squad so it was fitting that most of these lads who have come up through the age groups of the club together should get this opportunity to have at least one last proper get together and game to remember. 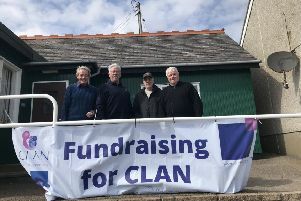 The tour was a culmination of almost a years’ worth of planning and fund raising which the boys fully embraced, it is with great thanks to the parent’s tour team fund raising committee of Ishbel Fulton, Heather Begg, Jill Law, Duncan Talbert, Ian Kirkwood and David Burslem who organised the Bag Packs, Race night, Ceilidhs and other events in order to make the trip affordable and possible, such was the success of the fundraising efforts once everything is paid for on the trip there will be a considerable sum left over for the club coffers. Also huge contributors were Mike Macey of Terramar Ltd who sponsored the boys playing strips which the lads get to keep as a memento of the tour, the team certainly looked the part in the individually personalised strips. For more details on this major sponsor please go to http://www.terramarltd.co.uk/. Another thanks to Redcloack Fish Bar for donating tour polo-shirts which the boys travelled in. The team stayed at the beautiful Celtic Camping site sitting on top of the Cliffs looking out to the Irish Sea in a renovated Bunkhouse with meals all provided on site. On arrival the group took in a wee 10km clifftop hike to the Abereiddy Blue Lagoon for a wee swim and splash in the former coastal Quarry, some being more adventurous than others. It was a great way to end a very long journey of almost 13 hours which was made somewhat easier being taken on one of the AFC team buses which with all leather seats, tables and kitchen area was a real bonus for the tour party. Huge thanks to Gary our Driver for the trip and Central Coaches for allowing us the use of this very special coach, It was testament to the skills of Gary that he managed to get such a large coach down the narrow country welsh lanes without incident. The game itself was a real eye opener for our lads, St. David’s RFC boasts two pitches and a good bar and club house and is very strong at all age groups. The opposition had some really large and physically imposing players in their starting line-up but this didn’t faze the Mackie lads one bit. Mackie with only a full 15 and no subs formed themselves as best as they could manage and once settled they worked very well as a team. The game started off with both teams making the usual silly little errors with neither team making any real in-roads for the first 10 minutes or so. The St Davids team who obviously thought that the smaller Mackie lads would be somewhat of a pushover soon realised that this was a team out with a point to prove and they soon began to use some underhand tactics to get the game their own way however once again the Mackie lads stood toe to toe with the bigger lads and gave no quarter. The size and speed of the Welsh lads soon paid dividends though with them having some international level athletes in their team and the 3 times they manged to break through the Mackie defence, these scores however somewhat flattered the St David’s lads and was not a true reflection of how things were really going. There was quite a bit of niggle creeping into the game with a few altercations occurring but as before the Mackie lads stood together as a team and looked after one another in a great show of unity. During a wee talk with Coach John Kelly at half time the guys resolved to change things around a bit and they set about the second half ready to prove that they came all that distance for a purpose. The second half opened with a quick St. David’s try and things were looking ominous, Mackie’s scrum and rucking play were improving no end and it was with this sustained pressure that Mackie fought their way up the field into the Welsh 22 which allowed Cameron Hepburn to muscle his way through on the right wing to crash over the line and score much to the delight of travelling and home crowd who could see the effort the Mackie lads were putting in and fully appreciated the efforts being made. The game was most certainly on now but the Welsh lads managed to use their phenomenal speedy runners to run in two more tries, you would think being six tries to one down the Mackie lads would have given up a little but this was not the case in the slightest, with a renewed resolve they again dug deep and powered forward again and again they took benefit from the only seaming fragility in the Welsh teams side which appeared to be on their left wing. In a near repeat of the first try Cameron Hepburn was bundled over the try line with ball in hand to touch down for a second try. Not content with this the Mackie lads kept on the pressure on the flagging St David’s defence. Ross Kirkwood was side-lined due to a nasty bump to the head as a precaution and St David’s coach supplied a replacement winger who just also happens to be the second fastest 100m sprinter in Wales, we think he could be quickest if he shaved off his beard! This fresh pair of legs along with the sustained Mackie pressure once again exposed the Welsh on their left wing and the stand in Winger flew through his team mates to score a lovely try. The game ended at six tries to three with most of the tries being converted in favour of St. David’s RFC. Following the game there was a brief social with the exchange of gifts between the clubs and officials. The Mackie lads were praised very highly by the Welsh clubs President who said that he had never witnessed a team going up against their U16 team who are considered to be the best group they have ever had and playing with such commitment and passion right to the end despite being so far behind. He praised the spirit of every Mackie lad on the pitch and was glad to have witnessed such a display of heart. As ever with these games and in traditional fashion there were the man of the Match awards with the St David’s full back and scorer of 4 tries winning the honours for them. For Mackie there was a long and lengthy discussion between the oppositions management to pick a Mackie MoM but they decided on Zander Begg who also played at full back and with his surging carries into the opposition was at times quite formidable. This said it could have been any one of the 15 Mackie lads who went up against a very big and skilful St David’s RFC team. We cannot begin to praise the lads enough for their commitment, attitude and behaviour on this tour they were an absolute credit to not only the club but their parents and most importantly to themselves throughout the entire duration of the tour. U16 Team - Cameron Hepburn, Ben Martin, James Swan, Sam Burslem, Iwan Kelly (Capt. ), Fennick Deans, Nathan Grundy, David Talbert, Josh Law, Mikey Mair, Kieran Fulton, Lee Robertson, Ross Kirkwood, Kyle Healy, Zander Begg. John Kelly (Coach), Robin Hepburn (Medic), Gary Robertson (Tour Manager).